Shopping shouldn't have to be so hard. What are their prices like? Style aesthetic, i.e. is everything geared toward twenty-somethings going to Coachella, or could I find something work-appropriate there? Do they carry a range of sizes? Do they tend to cater to one silhouette (body shape)? If so, what is it? For me, it's not enough to know that a boutique has a “cool vibe” or carries sustainable fabrics. When I asked women who came to WeFitMe’s clothing swap what they thought, I learned I’m not alone. They confirmed that shoppers want more information than we’re given by fashion retail's sleek marketing. That’s why I want to help get the word out about a new Portland boutique called a.ell atelier (3539 SE Hawthorne Blvd., Portland, OR). I visited a.ell for the first time recently and it was an unexpected delight! a.ell atelier’s owner and designer Angelique Ell has captured her love of Hawaii (where she has a sister boutique) by carrying comfortable designs with an easy, island vibe and focus on sustainable fabrics (organic cotton, hemp and bamboo). That’s all cool, but I know it’s likely not enough information to get you to make a special trip. Here’s the scoop you need. Angelique’s shop carries several brands and I was excited to see three local labels: Hubris by Rita Hudson, Indie Ella by Jayna Lamb, and Ruby Couture, in addition to Angelique's own a.ell atelier garments. These lines offer a wider range of sizes and flattering fits for different shapes. And since you know that’s what I’m about, I want to show you what I mean. 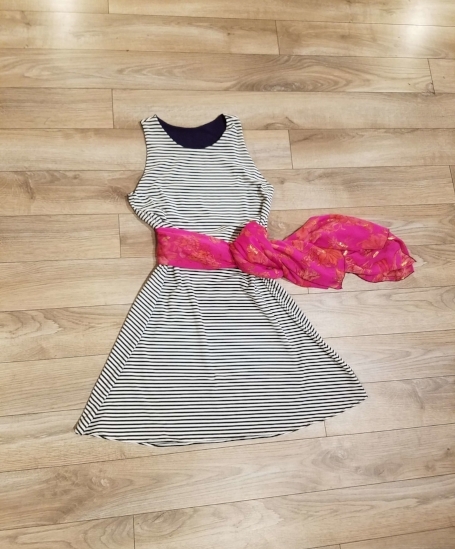 I asked Angelique if she could find two beautiful looks appropriate for a summer event (barbecue, party, wedding reception) for each of the five body shapes we focus on at WeFitMe: Apple, Pear, Hourglass, Inverted Triangle and Straight. Read on to see what we found! Here’s what we found that could look great on each shape. We’re giving you a flavor for what you might find so please bear in mind that these suggestions aren’t exclusive to one body shape – most could look wonderful on other shapes too. These two options are gorgeous for Apple-shaped ladies. On the left is a lovely, short dress or tunic with leggings. It’s great because it has an Empire waist (hits just under the breasts) so it breezily flows over the tummy in a dark navy and white rayon, accented with voluptuous red roses. It’s pretty, flirty and feminine, which seems to be hard to find in Apple options. 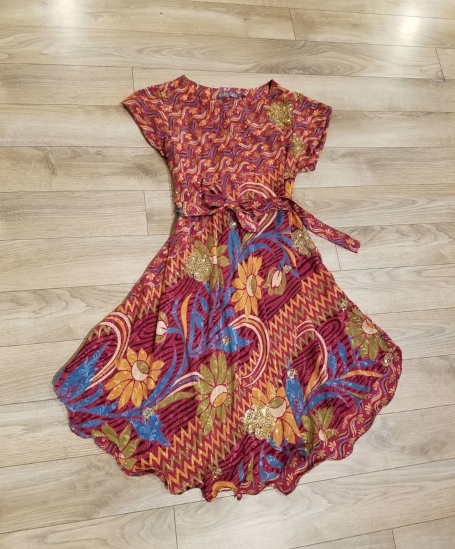 This one is a Size L.
The second is a classic Apple look, but this one is special because the deep crimson fabric is actually made from Indian sari silk. Designer Indie Ella re-uses high-end sari silk (used by women so wealthy they only wear a sari once!) to make one-of-a-kind garments. They’re luxurious, feather-light and very reasonably priced (around $70). Angelique paired this gorgeous top with some white denim for a chic and comfortable look. This is a “one-size-fits most” type of poncho cut, so it can work for many different women, even up to a size 20. Conventional wisdom for Pears is that we want to “balance” our larger bottom half by choosing clothes that “draw the eye up” and create interest on the top where we are smaller. Sometimes having something more fitted on top and loose on the bottom can do this. Both of these dresses fall into that category. This is another gorgeous dress from Indie Ella made from Indian sari silk. It has vibrant colors and surprise sparkling gold flowers. Again, the shape is more fitted on the top, it comes with a fabric belt and the light silk floats lightly over the hips. It’s perfect! You wouldn’t think that the Hourglass ladies would have a hard time finding clothes that fit, but according to the ones I’ve talked to, they have it tough too. Angelique, an Hourglass herself, could recommend these two looks from experience. This soft, yellow rayon dress by “Trashy Diva” with a 1940s vibe, takes advantage of the Hourglass’s curves in the sweetest way. The Indie Ella silk dress on the right was tough for me to understand at first as a good Hourglass look. But Angelique explained that the fabric is cut on the bias, so without any special belts or waistbands, it naturally hugs a woman’s unique curves. She swears by a dress cut on the bias, so I’ll take her word for it. The Inverted Triangle-shaped gals had several cute options at a.ell. Both of these looks can provide some interest on her lower half that can “balance” her relatively wider shoulders, giving her more of a standard hourglass appearance. The tank top gives room for the shoulders in both. The look on the left by Portland's Ruby Couture, has fun ruffles on the bottom that add a little more volume. The sporty A-line bamboo knit on the right is one of Angelique’s own a.ell atelier designs. The fuschia scarf/sash adds a pop of color that draws the eye down, emphasizing her waist. Ladies with a Straight shape often want to find looks that help them have a curvier silhouette by using belts or other contrast at the waist. These two looks are wonderful on a less curvy figure. The short, dark floral romper has a thin contrasting belt at the waist. The black, white and fuschia sundress, another Ruby Couture design, uses contrasting color and pattern to offset the bust and hips, giving the impression of more curves. What I notice after looking at all of these selections is how much variety a.ell atelier has, but it’s woven together with an emphasis on comfort and feminine style. And I didn’t even mention the stunning, hand-painted corsets and wedding dresses or the unique jewelry. 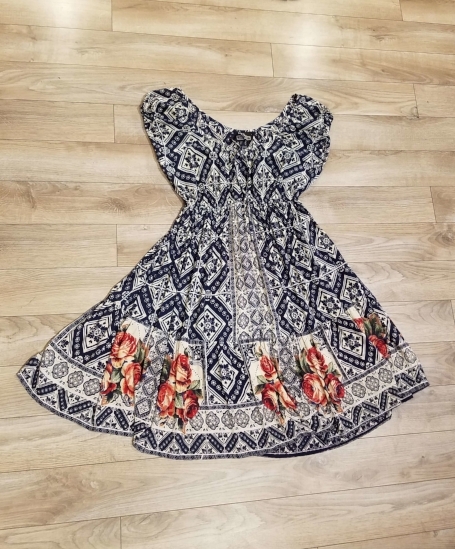 The prices are reasonable for good quality and ranged from the $70-ish for the stunning one-of-a-kind silk tops to a bit over $100 for some of the dresses. a.ell atelier didn’t have every size in every look here, but that’s common at boutiques. They only buy so much of an item and when it sells, it’s gone. But the experience of shopping with Angelique was fun, and I really appreciated her willingness to try this idea of shopping by shape with me. There is so much to see in this little store! Clarissa Cooper of Portland OR is the founder of WeFiTMe, an online community of like-bodied women helping each other find clothes that fit. Clarissa has over 30 years of experience in the women’s apparel industry as a CONSUMER, as well as a background in finance in the energy industry. This is Clarissa's first blog, but it’s not her first rodeo. Want to get the latest? Send it right to me! Copyright © 2016 WeFitMe, LLC. All Rights Reserved.